I loved climbing trees as a kid. Lucky for me our backyard was a mini forest of fir, redwood, and bay. My favorite was the lone and large acacia tree. I’d climb as high as possible and onto a perfectly curved branch that made a comfortable seat when I leaned against the trunk. At that height, I entered my own world; I’d dive into my imagination for hours. My cat Little would often climb up after me and settle on my lap. I’d talk, he’d meow; we had deep conversations about our adventures, birds, those darn squirrels… My daughter commented recently that it isn’t normal to have discussions with a cat. I’m okay with that. 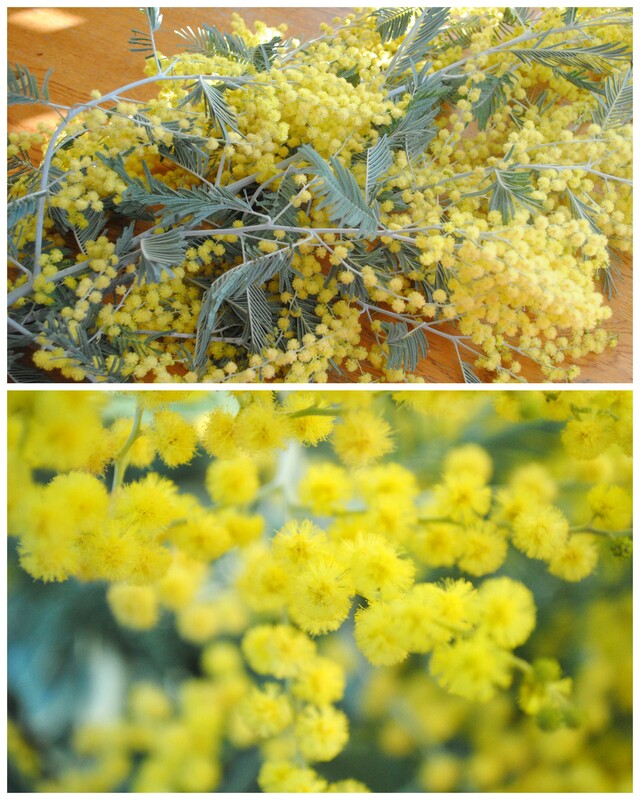 Where I live in Northern California, acacia trees bloom between February and March. I knew that Acacia catechu made a dye, but I didn’t think my childhood tree was of the same variety. This would be a new (to me) experiment, and I hoped the perfect dye to bring in spring. 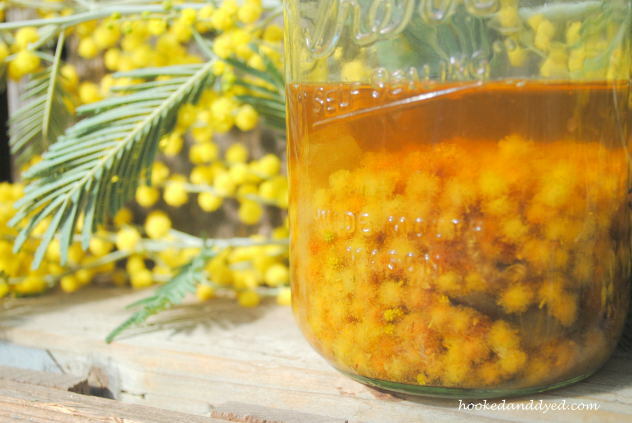 To start, I pulled a handful of yellow flower puffs from a branch, mixed them with tap water in a jar, and let the combination sit overnight. I checked it the following morning and the water was yellow. Yay! Promise! I poured the solution into a small pot, added my alum mordant yarn sample, brought it to a simmer for about 20 minutes, then poured it back into my jar to cool. After rinsing and drying the sample, the yarn stayed lemon yellow, similar to the color of the flower when fresh. Inspired by my experiment, I tried a real dye the following day before the flowers completely dried out; within 24 hours, their color changed from lemon yellow to amber yellow. 1 skein of alum mordanted (I think) wool yarn. The dye simmered without the yarn for 30 minutes, I added the yarn and let it simmer for another 30 minutes, while watching the skein slowly turn yellow. I took the pot outside and let the yarn cool in the dye for several hours. There was no particular reason for doing it this way; it was just how the process unfolded. 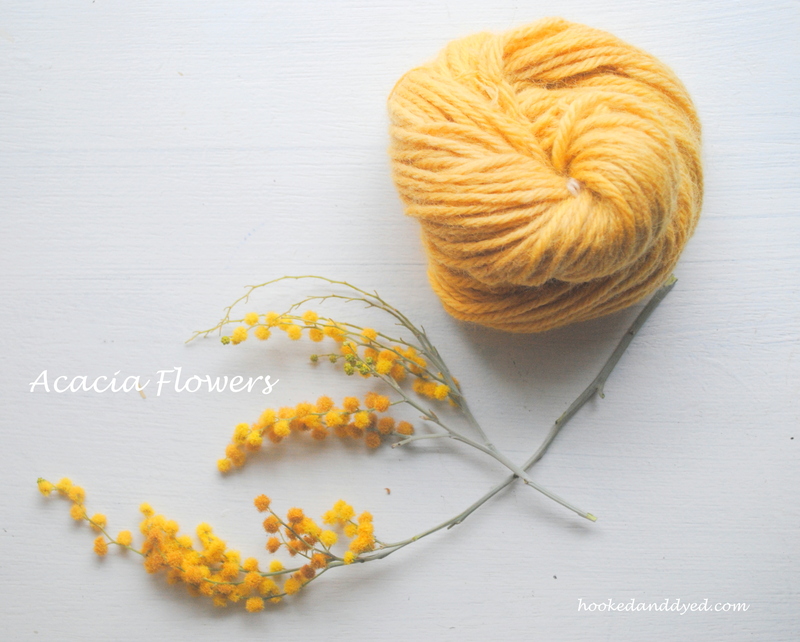 As the picture above shows, this skein turned the same amber yellow as the slightly dried flowers. My favorite tree that filled my childhood with happy memories also makes an equally cheerful yellow dye. It was the perfect dye experiment to start what I hope is colorful new dye season. Great experiment! Beautiful colors- love your photos! Aww – thanks! I’ll check it out.